Parking reformers, this is one you’re going to want to bookmark. The announcement that Seattle would be raising parking rates in certain neighborhoods was greeted with a good bit of teeth gnashing — and that continues, especially among some business owners. But the data just doesn’t bear out all the concern, according to an analysis by the Sightline Institute, a Northwest policy think tank. 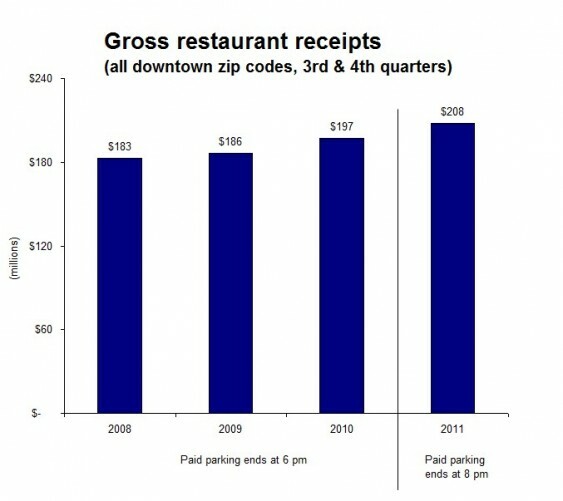 Gross receipts for downtown restaurants have actually risen since the parking meter hikes went into effect. It may sound counter-intuitive at first, but on inspection it turns about to be totally sensible. By increasing turnover in on-street parking and ensuring that spaces are available for customers, well-calibrated parking policies really can increase patronage. (After all, would you rather grind through congested downtown streets in the rain while hunting for a parking space or pay a few bucks to stash the car curbside until 8?) In fact, boosting business is exactly what Seattle set out to do when officials adjusted meter rates and extended paid hours downtown. It’s worth noting that full-service restaurants have been faring better this year nationwide as a result of an improving economy, according to this analysis by the New York Times. And downtown Seattle’s jump of 5.5 percent, as shown in the chart above, is substantially below the national increase of 8.7 percent nationally, as reported in the Times, though that number is specifically for sit-down restaurants. There are a million factors that could be at play there, and there’s no reason to assume two more hours of paid parking per day kept Seattle’s numbers down. So more research on a wider sampling of cities would be necessary before we say with certainty that higher parking prices don’t impact local business receipts. But when Seattle’s restaurant revenues are still robust and growing, it sure does make all the alarmism over parking reform less convincing. To be the contrarian for a second, it looks like there is reason to think parking prices have kept down restaurant receipts: the growth was lower than the national average. What about the two datasets is different? One cannot rule out that parking is partially to blame. Note that I do advocate for progressive parking policies, but claims like this should be fully substantiated before used in our activism and presentations. “And downtown Seattle’s jump of 5.5 percent, as shown in the chart above, is substantially below the national increase of 8.7 percent nationally.” And why would this prove that putting parking meters in front of downtown restaurants had a positive impact? I gather from the data that paid parking after 6 PM reduced restaurant receipts by 3.2 percent. @OctaviusIII:disqus Agreed, but it certainly puts to rest the widely-held, knee-jerk belief that increasing meter rates decreases business revenue. At best, there could be an argument that it doesn’t increase *as* *fast*, but that’s all you could say. And after all, who’s to say how much increase is appropriate when there are pros (increased parking turnover, more real cost of the normally-externalized cost of driving, and extra revenue) and cons (at best, *less* increase in business receipts) to increasing parking rates? I think this is a complex issue where you have to consider all the pros and cons while realizing that it’s not nearly as black and white as most people make it out to be. So what’s your point? It’s the economy stupid. And how do we know that the improvement in the return at full service restaurants is due to “improving economy”? Might it be due to the fact that both partners have to work longer hours and hence tend to eat out more often? Or to another factor related to Seattle, such as improving weather? Most of us do not see an increase in the economy. A cross connection between valet parking and a restaurant.The Seattle restaurants see more revenue after parking places increase. Walsh seems to have reached a conclusion without fairly assessing the program and trying to make it work.